31 December 2018 - Mowed top area. 0.5hrs. 27 December 2018 - Collected mower and finished mowing southern and western woodland. 2.5hrs. 24 December 2018 - Slashed northern section of western woodland. 2hrs. 21 December 2018 - Weeded around picnic area and spread 4 loads of mulch on cardboard in far western woodland. 3 volunteers - 6hrs. 14 December 2018 - Community work day. Weeded around picnic area and spread 6 loads of mulch on cardboard in far western woodland. 8 volunteers - 27.5hrs. 8 December 2018 - Mowed top area, about 2/3 of southern woodland before a blade broke. Fixed the blade and then had a flat tyre within half a circuit. Slashed top area. 2 hours work. 25 November 2018 - Community work day. When we got to Burke Road reserve this morning they were four cars in the Chris Cross car Park and there were cans and bottles lying around. I walked down to the party area and there were two tables, fairy lights, cans, bottles and a couple of rubbish bags still around. I rang the police who came within about 15-20 minutes. So we spent a fair bit of time cleaning up. There was a syringe in a sharps container at the party site and one in a plastic bag near the picnic shelter. We also weeded near the area pulling out Trad, kapok vine, nightshade and weedy grasses. 7 volunteers - 24.5hrs. 17 November 2018 - Mowed top area. Bat check; 6 bats in 3 tubes. 9 November 2018 - Community work day. Weeded east of billabong. 6 volunteers - 19.5hrs. 3 November 2018 - Checked billabong for water. All dry. 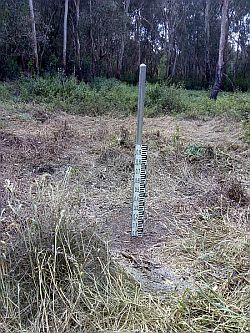 Soil around gauge was damp but not muddy. 28 October 2018 - Community work day. Weeded near picnic area. 5 volunteers - 20hrs. Nankeen night heron, pied currawong, fantail, wrens, magpie, mudlark, rock dove. Australian Magpie 8, Brown Thornbill 1, Common Blackbird 1, Crimson Rosella 6, Golden Whistler 2, Grey Butcherbird 2, Grey Fantail 7, Little Raven 4, Magpie Lark 7, Noisy Miner 14, Rainbow Lorikeet 16, Red Wattlebird 13, Rock Dove (Feral Pidgeon) 5, Striated Pardalote 3, Sulphur Crested Cockatoo 1, Superb Fairywren 5, White Browed Scrub Wren 7, Pacific black duck 4, Chestnut Teal 2, Aust White Ibis 14, Olive backed Oriole 1, Pied Currawong 1. 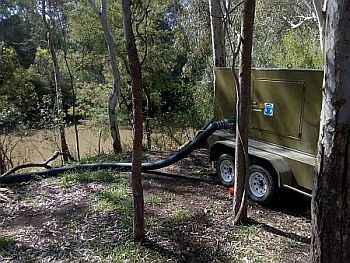 25 October 2018 - Melbourne Water continued to pump water from the Yarra river's environmental flow into both Burke Rd. and Willsmere billabongs. The water from the first two days dispersed overnight. 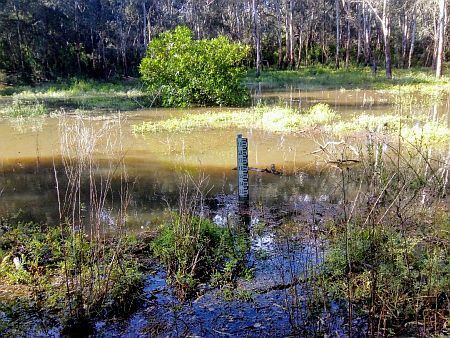 About half the water from 24 October remained and with further pumping today, the water was covering the vegetation in many parts.Two pacific ducks and an ibis were at the billabong. A check of chainsaw hollows found them all empty. 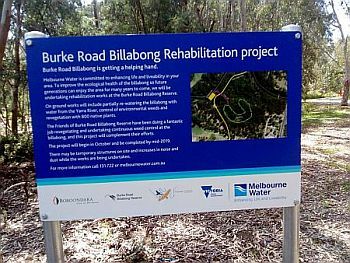 22 October 2018 - Melbourne Water commenced work to pump water from the Yarra river's environmental flow into both Burke Rd. and Willsmere billabongs. The water from the short first day dispersed overnight. After the second day of pumping the water was at 150mm, and some was visble above the vegetation. It created quite a waterfall leaving the pipe. 12 October 2018 - Community work day. 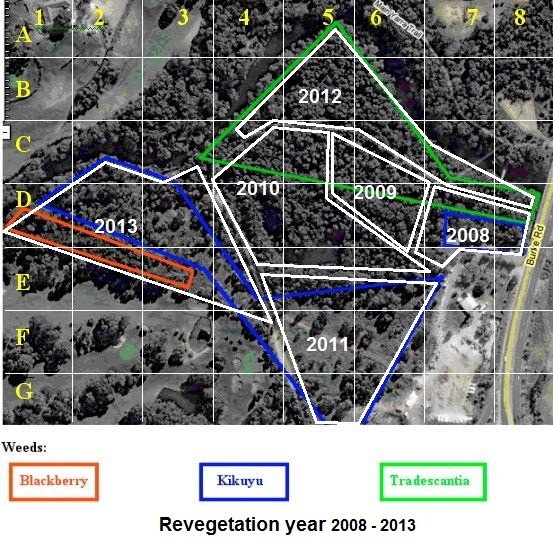 Planted 54 Poa ensiformis, 108 basalt daisy (Brachyscome multifida- 54 Greensborough form & 54 Waverley form) in western woodland. Moved 3 trailer loads of mulch to western woodland. 13 volunteers including 7 staff from CPA - 50.5hrs. blue-tongue lizard, chainsaw hollow check found no occupants. 30 September 2018 - Community work day. Weeded near picnic area and billabong. Moved 5 trailer loads of mulch to western woodland. 5 volunteers - 20hrs. 28 September 2018 - Checked trail cam - wallabies in both billabong and western woodland, ibis, and fox in western woodland. Mowed MW track. 15mins work. 21 September 2018 - Oiled picnic shelter. 15mins work. 17 September 2018 - Tree hollow check. 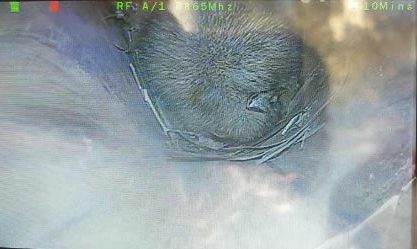 A rat (bush rat?) in chainsaw hollow in western woodland. Other chainsaw hollows empty. 14 September 2018 - Community work day. Planted 54 kidney plant (Dichondra repens), 54 sweet bursaria (Bursaria spinosa), 27 hazel pomaderris (Pomaderris aspera), 27 kangaroo apple (Solanum laciniatum)on banks at top car park, near Burke Rd., and shipping container. Carried 3 logs to protect plantings from BMX riders. 8 regular volunteers. - 24h work. 10 August 2018 - Community work day. Planted 108 kidney plant (Dichondra repens), 54 branching bluebell (Wahlenbergia multicaulis), 54 bidgee widgee (Acaena nova-zelandiae), 27 chocolate lily (Arthropodium strictum), 27 tall sedge (Carex appressa) . Spread 1 trailer and 2 ute loads of mulch. 6 regular volunteers & 8 Camberwell Grammar School students plus teacher . - 48h work. 27 July 2018 - Moved 2 trailer loads (4 large & 2 small wheelie bins each) of mulch to western woodland from the gate. 1h work. 10 August 2018 - Community work day. Planted 54 ruby saltbush (Enchylaena tormentosa), 54 tufted blue bells (Wahlenbergia communis) . Spread 2 trailer loads of mulch. 7 volunteers. - 22h30m work. 29 July 2018 - Community work day. Planted 27 Hazel pomaderris (Pomaderris aspera), 27 tufted blue bells (Wahlenbergia communis) 54 poas (Poa ensiformis), 54 bidgee widgee (Acaena nova-zelandiae) 108 kidney plant (Dichondra repens), in the western woodland. Spread 2.5 ute loads of mulch, and weeded fumitory there. 7 volunteers & 12 Camberwell Grammar boys with 1 teacher. - 68h40m work. 13 July 2018 - Community work day. Planted 27 twiggy daisy bush (Olearia ramulosa), 27 rice flower (Pimelia humilis) 27 Austral indigo (Indigofera australis), 27 Naked stork's bill (Pelargonium australe), throughout the reserve. Replaced mower blade and finished mowing western woodland. Weeded picnic atrea, planted bank near Burke Rd. and spread some mulch there. 6 volunteers - 18.75h work. 4 July 2018 - Moved 5 trailer loads (4 large & 2 small wheelie bins each) of mulch to western woodland from the gate. 3h work. 24 June 2018 - Community work day. Planted 27 sweet bursaria (Bursaria spinosa), 27 Hop goodenia (Goodenia ovata) 54 prickly moses (Acacia verticillata), 27 hazel pomaderris (Pomaderris aspera), in far western woodland. Partially demolished recently repaired BMX jumps. 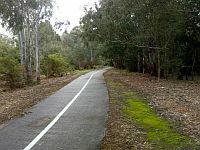 White line painted down middle of main Yarra trail recently. 7 volunteers - 26.5h work. 18 June 2018 - Moved about 6 trailer loads (4 large & 2 small wheelie bins each) of mulch to western woodland from the gate. 3h work. 8 June 2018 - Community work day. Planted 50 Forest germander (Teuchrium corymbosum), 50 wedge-leaf Hop bush (Dodonea viscosa) 54 poas (Poa ensiformis), 54 common cassinia (Cassinia arculeata), 27 rock correa (Correa glabra) in western woodland. 6 volunteers - 24.5h work. 27 May 2018 - Community work day. Planted 50 Hop Goodenia (Goodenia ovata), 50 wedge-leaf Hop bush (Dodonea viscosa) 54 poas (Poa ensiformis), 54 kidney plant (Dichondra repens), 54 dianella (Dianella laevis) in western woodland. 7 volunteers - 23.5h work. 18 May 2018 - Moved about 6 trailer loads (4 large & 2 small wheelie bins each) of mulch to western woodland from the gate. 3h work. 29 April 2018 - Community work day. Cancelled due to predicted rain all morning. 5 May 2018 - Viv, a Committee member, and Aldo (Husband/Carpenter) fixed up the culvert fence, and set it back from the path per original plans. Fence originally erected by local carpenter Peter Rankin who did not come back to discuss problems or fix. Removed 2 weed trees north of path. - 9h work. 29 April 2018 - Community work day. Planted about 250 weeping grass (Microlaena stipoides) on south-east bank of billabong and watered them in. 7 volunteers - 23.5h work. 26 April 2018 - Mowed southern woodland 2h work. 13 April 2018 - Community work day. Mulched further into the western woodland - spread 3 ute loads of mulch. Oiled picnic shelter. Cleaned mower and blade started. 7 volunteers - 23.75h work. 12 April 2018 - Mowed western woodland - mower blade stopped. 1h work. 25 March 2018 - Community work day. Mulched further into the western woodland - spread 4 ute loads of mulch. 9 volunteers - 19.25h work. Bat check. 2 male & 6 female bats in 4 tubes. 1 escapee. 9 March 2018 - Community work day. Mulched further into the western woodland. 6 volunteers - 20.5h work. 2 March 2018 - Weeded billabong floor of ink weed, spear thistle, nightshade and kapok vine. 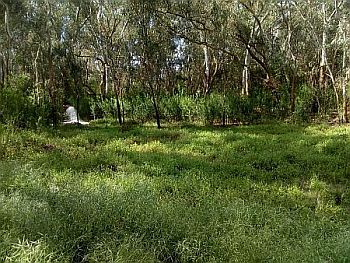 Mowed eastern woodland b/w billabong and ephemeral wetland. 2h work. 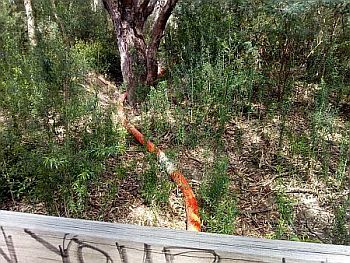 1 March 2018 - Put a bird box (which had fallen) back up, put trail camera up overlooking billabong, poisoned some desert ash near southern sign board which had re-sprouted, poisoned 6 desert ash and a hawthorn near Chris Cross slope. 2h work. 25 February 2018 - Community work day. Mulched further into the western woodland. SB demolished BMX jump. 12 volunteers - 25h work. 17 February 2018 - Trimmed back some branches which fell near the path in last week's windy weather. Set up some drop spots for mulch for the next workday. Swept the path near the culvert, which was covered in leaf litter. 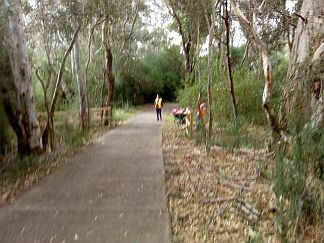 As I was sweeping, John, a cyclist who commutes through the reserve came the opposite way with a leaf blower, clearing the path. 2h work. 9 February 2018 - Community work day. Mulched further into the western woodland. 8 volunteers - 19h work. Mowed Western woodland - south-west section. 21 January 2018 - Weeded hawthorn, madeira winter cherry, pittosporum, kapok vine, spear thistle, ink weed, and nightshade in billabong floor. 2h work. 28 January 2018 - Community work day. Mulched further into the western woodland. Finished early due to heat/humidity. Flat tyre on mower. 10 volunteers - 15.5h work. 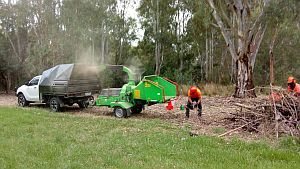 25 January 2018 - Chipping contractor chipped timber debris along the MYT, and in southern and western woodlands. Replaced mower blade damaged on 21 Jan. 5h work. 21 January 2018 - Mowed north-western section of western woodland, and shifted a number of logs. Weeded hawthorn, madeira winter cherry, pittosporum, japanese honeysuckle. 3h work. 12 January 2018 - Community work day. Mulched further into the western woodland. 6 volunteers - 18h work. Over the last week, toilet flush pump rubber replaced, and toilet pumped out. 1 January 2018 Mowed top area, and the eastern section of western woodland. Weeded hemlock near road bridge. 2h work.